The Indian Supreme Court is widely recognized as a complex and dynamic institution. It has been the subject of much acclaim, as well as criticism. The Court has even been charged with overreaching itself and intruding into the domains of the executive and the legislature. In an era of globalization and judicial activism, the experience of India, offers a valuable perspective on the role judges play in a vibrant democracy. What explains the choices that India’s Supreme Court justices make? Do judges make distinctions between the religious and political affiliations of the accused when adjudicating anti-terror cases? If so, why, and under what conditions? In an era of globalization, India’s experience offers a valuable perspective on the role judges play in a vibrant democracy. Hear Shylashri Shankar address these questions, in a talk drawing from her recent book, Scaling Justice: India’s Supreme Court, Anti-Terror Laws, and Social Rights. Shylashri Shankar is a Senior Research Fellow at the Centre for Policy Research, New Delhi. She was previously an Assistant Professor in the Government Department at the University of Texas at Austin, and a Postdoctoral Fellow at the Centre on Religion and Democracy at the University of Virginia, Charlottesville. She has received degrees from the University of Delhi, University of Cambridge, the London School of Economics and Political Science, and Columbia University. 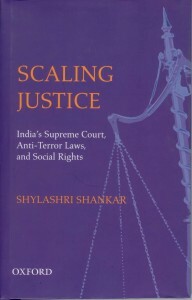 She is the author of Scaling Justice: India’s Supreme Court, Anti-Terror Laws, and Social Rights (Oxford Univ. Press 2008). She has written several articles in edited books on secularism, the judiciary in India and Sri Lanka, India’s courts and religious conversion, cross-judicial borrowing and national constitutions, among others. She has also written op-eds in national newspapers and magazines on democratic transition and consolidation in South Asia and the Middle East, judicial independence, ethnic conflict, and terrorism.